Are you curious what you’ll qualify for in the way of a credit card limit, or if you’ll even be approved to begin with. Well, sadly, it’s always a bit of a mystery until after you apply and receive your credit card (and its related terms). That’s right – there’s no turning back once you hit the apply button. The hard credit inquiry will show up on your credit report and the credit card issuer will make their decision. You may have been hoping for a $10,000 credit card limit, only to find out minutes later that they approved you for a measly $1,500 limit. At that point, you may be fuming, wishing you hadn’t even bothered in the first place. Let’s look at what you can do beforehand to avoid nasty credit limit surprises. You can certainly clue yourself in a bit before you apply for a credit card, though there’s never any guarantee. Credit card issuers tend to look at two main things when determining your credit limit, those being your credit score and your income. It used to be household income, but now it’s just your income, since living with your wealthy parents doesn’t necessarily mean they’ll pony up if you can’t pay your debts, especially if they aren’t actually co-signers on your credit card. Credit card companies also ask for employment information (and sometimes schooling prior to that) to get a better idea of what you make, considering the fact that you simply write in a number on the credit card application. They then take that information and look at it alongside your credit score, together with the information in your credit report, to determine your credit card limit. If you already have high credit limits on existing credit cards, there’s a decent chance you’ll get similar limits on any new credit card you apply for, assuming those limits aren’t exhausted or near their max. Conversely, if your existing credit card limits are low, don’t be surprised to receive similar limits on subsequent credit cards (unless you input significantly higher income on the credit card application). As you can see from this sample credit limit matrix from Credit Karma, those with lower credit scores and lower gross annual income will receive lower credit card limits, and vice versa. So a consumer with an average credit score and low income who applies for a credit card may receive a $3,000 credit card limit, while a consumer with an excellent credit score and higher-than-average income may receive a $25,000 credit card limit. Of course, it’s hard to just say, “You make X amount and have Y credit score, so you’ll receive Z credit limit.” It’s likely a lot more complicated than that, and if you don’t work for a credit card issuer, you’ll never really know all the details. The takeaway here is that those with more income and better credit scores tend to receive larger credit card limits. So if you want a big limit, you know what to do. Additionally, those with limited credit history will probably see lower credit card limits than those with proven track records of supporting large amounts of debt, so understand that it takes time. You need to build trust in order to be trusted. Lastly, if you’ve already got lots of outstanding credit card debt and your credit utilization is high, expect subsequent credit card limits to be quite small because credit card issuers don’t like to provide more credit so those who are already overextended. In other words, a good job coupled with a solid credit score won’t necessarily equate to a large credit limit if you’ve already blown through your existing cards. That being said, try to go into a new credit card application with zero balances on all your existing credit cards if possible (especially those from the same issuer). *Keep in mind that charge cards, such as the American Express Platinum Card and Chase Ink, don’t have a pre-set spending limit and must be paid in full each month. What About Aggregate Credit Limits with One Issuer? Another factor that may come into play with your credit limit is how much you’ve already been allocated on credit cards with the same issuer. For example, if you’ve got two Chase credit cards with $25,000 credit limits (totaling $50,000) and decide to apply for a third Chase credit card, you may receive a very low limit on the new card or be outright denied thanks to your large existing credit lines. Credit card issuers also limit the total amount of credit they’ll extend across all cards, so if that number happens to be $50,000, you’d be denied on the third card. To get around this, you could call Chase and ask that they lower one of your existing credit limits and move that amount to the third card. This will allow them to approve you for the third card because no new credit is actually being created. This is referred to as “reallocation.” In a sense, you’re simply shuffling credit, as opposed to getting additional credit, which the bank will be a lot more comfortable with. Generally, this issue comes up when someone is trying to take advantage of multiple rewards or sign-up bonuses with one issuer. So if you’re denied, or your credit limit is super small, call the issuer right away via their reconsideration line and ask about shuffling some of your unused credit to the new card. I also call my issuers and ask to reallocate the majority of my aggregate credit line to the card I use most, seeing that there isn’t much point in having a giant line of credit on a card I never use. I had an Amex Blue card with a $30,000 limit that I literally used for one small purchase a year. I called Amex and had them reallocate most of it to my Blue Cash card, which I use all the time. That way I never have to worry about reaching my limit, and I keep my utilization very low. 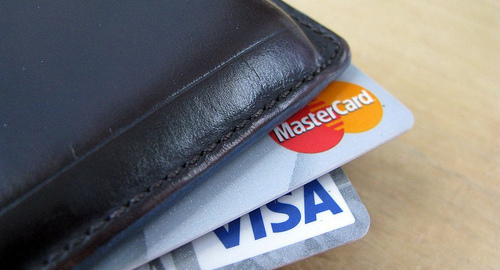 Remember, utilization matters on every credit card you have open. You can also reallocate from a card you plan to close, thereby recycling your credit. For the record, you can reallocate nearly all of a given credit line, but I prefer to leave at least a $1,000 or so on the unused card just in case. Also note that you can’t reallocate your credit limit between business and personal credit cards. So if you have $30,000 on a business card that you want reallocated to your everyday personal card, no such luck. Also note that you can be denied a personal credit card if you’ve got a lot of business credit with the same issuer. To them, it’s still credit you have at your disposal, and they don’t want to overextend it to one customer. As noted, this can’t be reallocated, so you may want to close unused business accounts from time to time. Tip: Having a lot of outstanding credit card debt can lower your credit score, so it’s best to keep balances at a minimum, regardless of how high your credit card limit might be. Credit limits also vary by card issuer. For example, I got $20k from Chase but only $10k from Citi. And nothing was different between my applications. Next Next post: What Is Credit Card APR?